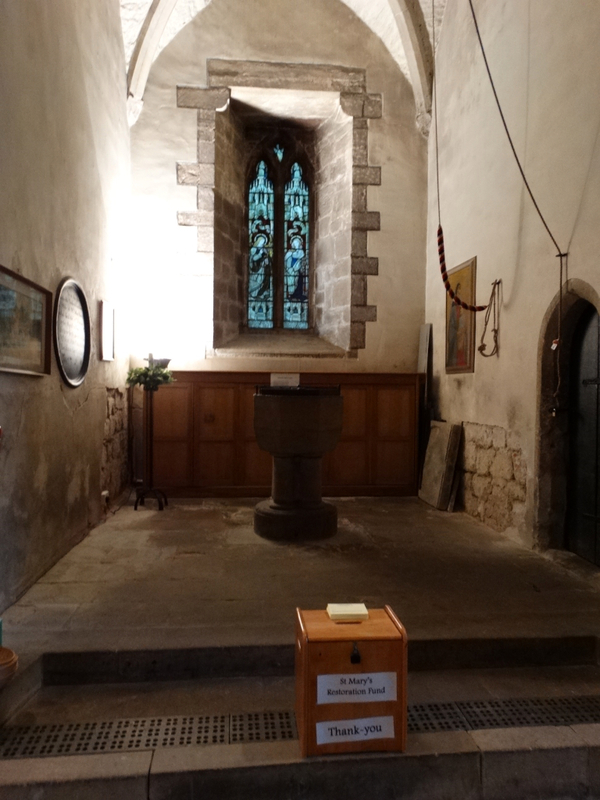 Tuesday 8 September 2015. 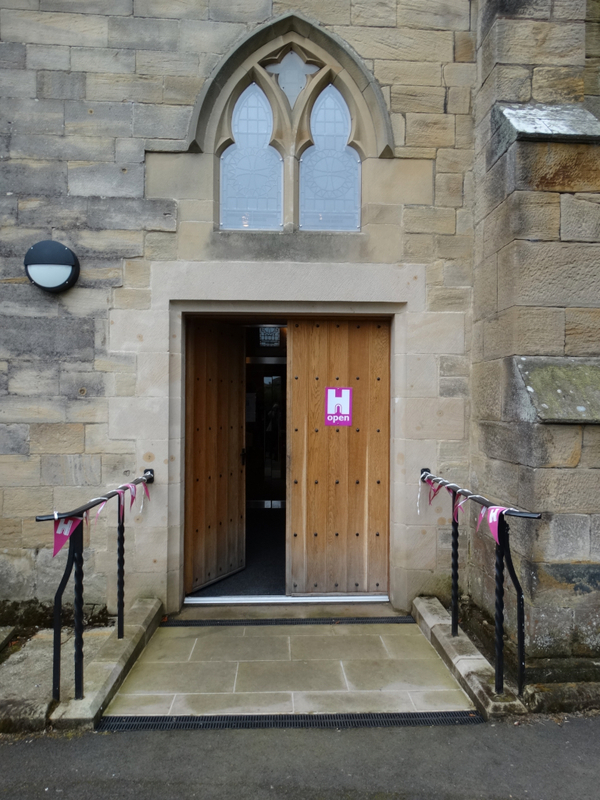 The coming weekend is Heritage Open Days, but the church of St Mary the Virgin in Morpeth is open every afternoon this week. I had spent a day at Diocesan House (that’s a day of my life I won’t get back), so decided to salvage something with a church explore. 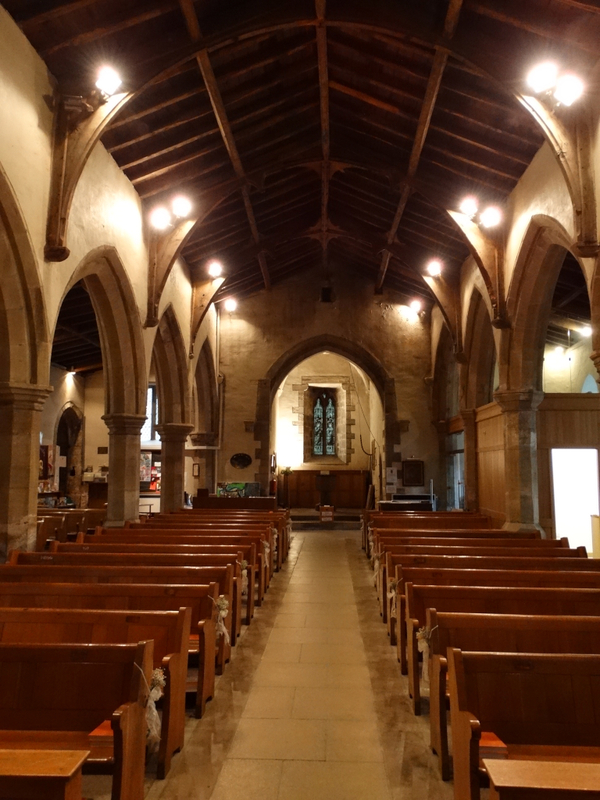 Brian the churchwarden, who used to direct Julie’s Monday choir, was there, made me coffee and gave me a guided tour. 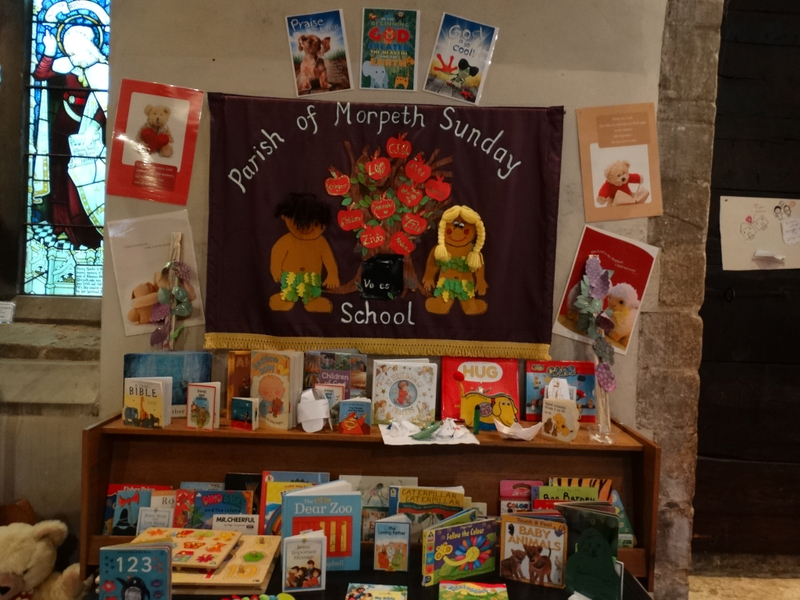 The Morpeth churches have a website. St Mary’s is on the south of the town at NZ196852, beside the old A1. 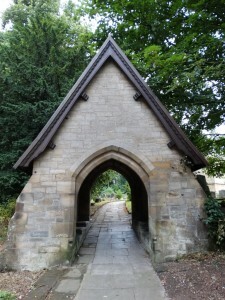 I have driven past on many occasions, this time I parked and walked through the commanding Lychgate which was erected by the Fenwick family of Netherton in 1861. 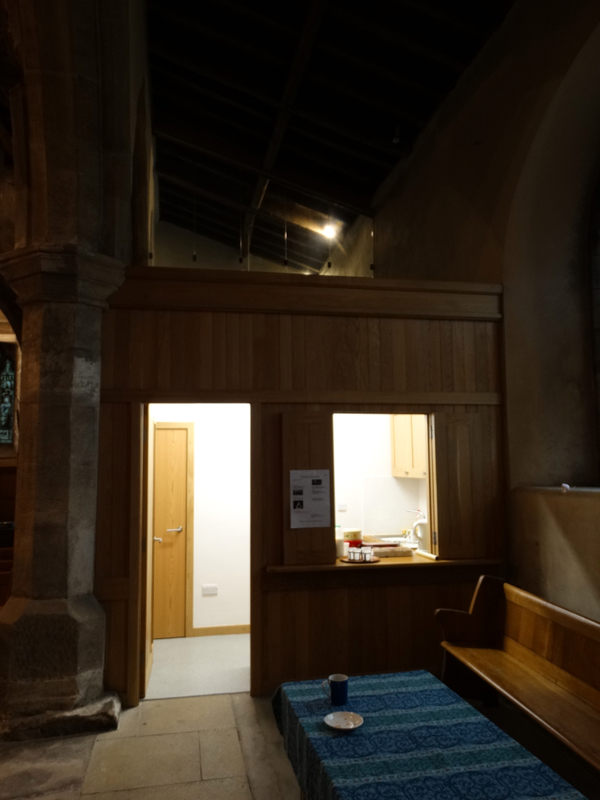 I headed to the south side of the church, to find that a new entrance is on the north – nice and flat with a decent door. 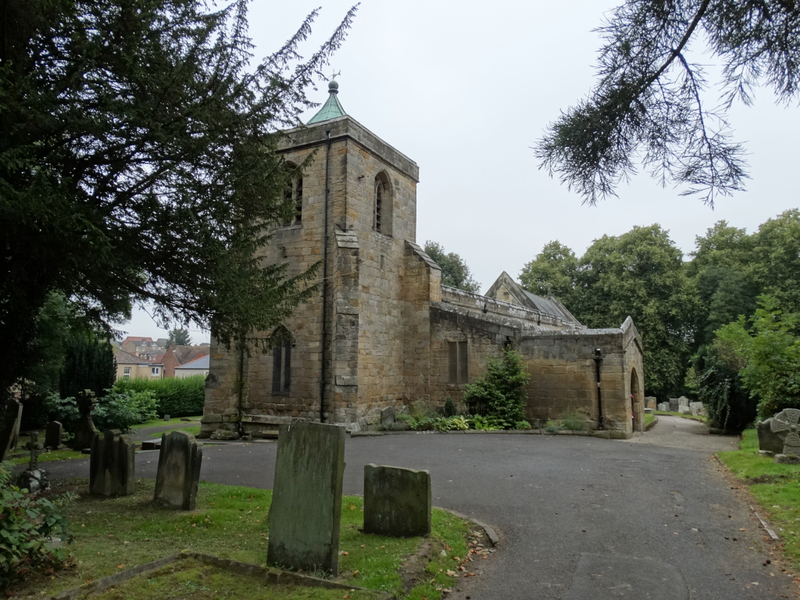 In the 1980s, Ponteland’s Richard Bailey worked, with others, on a survey of the church, using dowsing to suggest there is a late Anglo Saxon church on this site. 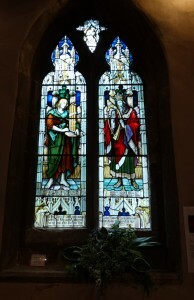 After the Conquest Ranulf, the grandson of William de Merlay, one of William the Conqueror’s knights, was given the Barony and lands of Morpeth. 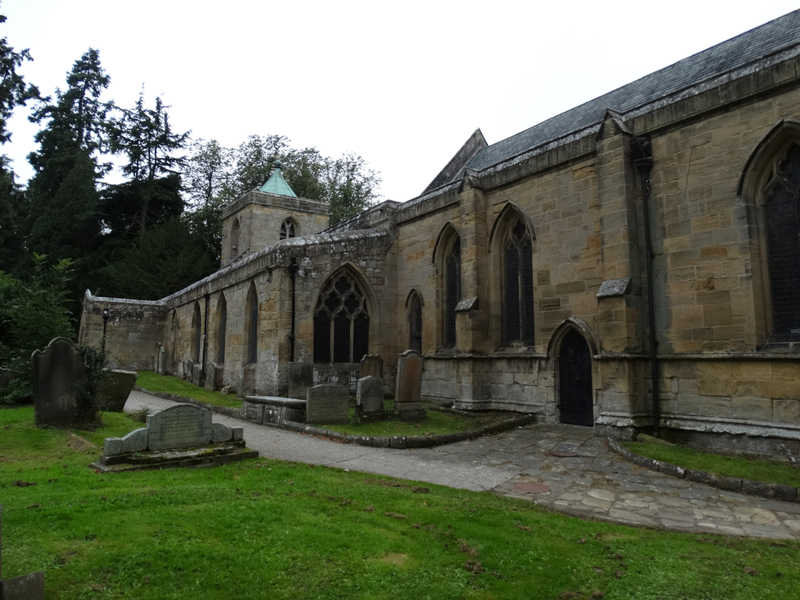 He invited a group of monks from Fountains Abbey in Yorkshire to come north and built an abbey at Newminster, a few miles west of the town. Their masons would have rebuilt this church. The south door is wonderful. 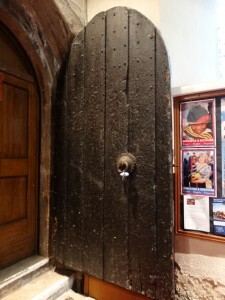 It had two thicknesses of boarding, the outer vertical, the inner horizontal. 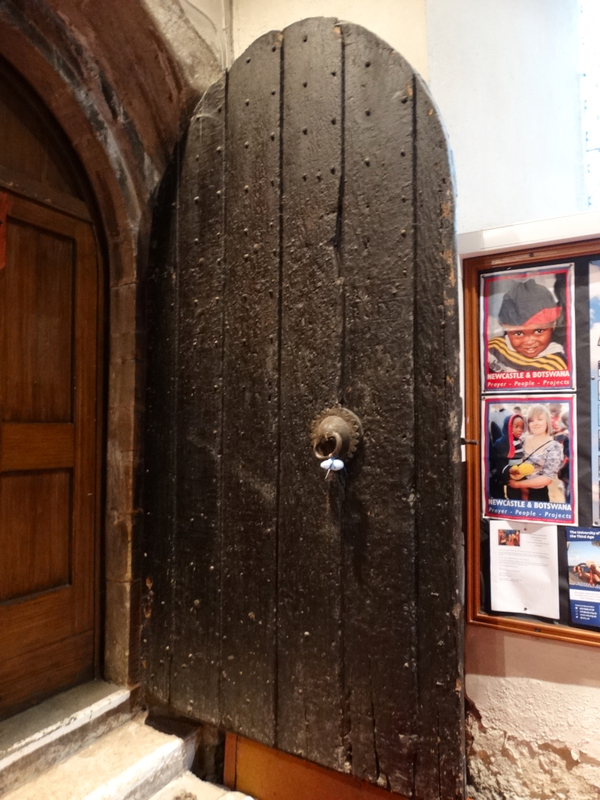 The hand-made nails and ironwork hinges are original C14. 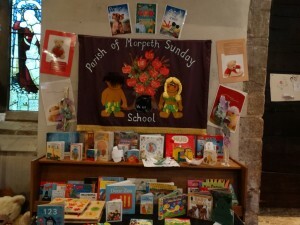 I like the Sunday School’s work – Eve has a wonderful fig leaf bikini (there must be a market for a design like that!) 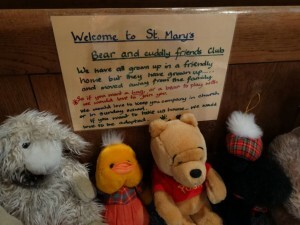 – and the Bear and Cuddly Friends Club. 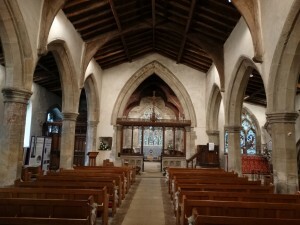 The main arcade of the nave with its pointed arches are late C12. Every capital is different. 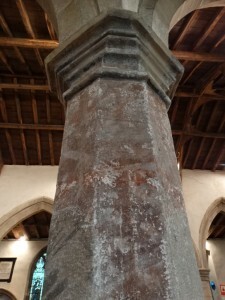 Some of the pillars are painted – medieval painting in red and black – and masons’ marks make a link to Newminster Abbey and a date of 1188. 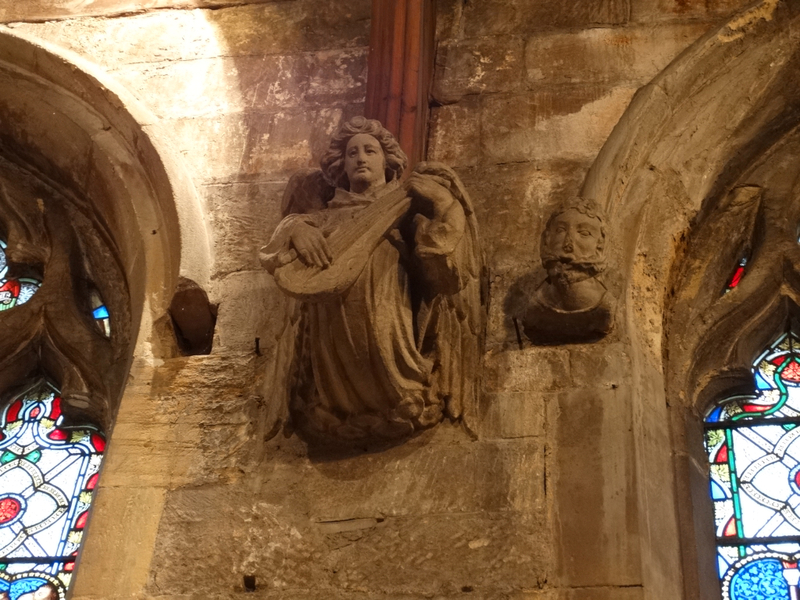 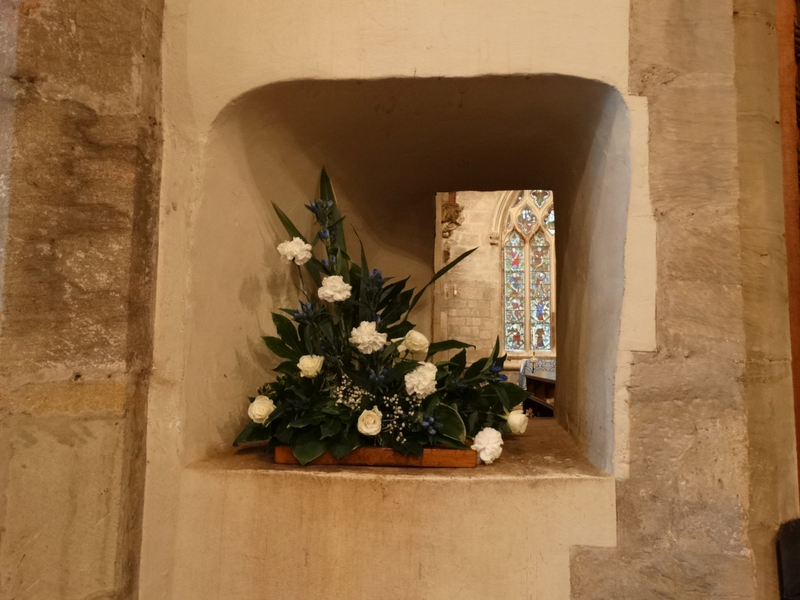 There is a lovely squint in the north joint of the north joint of the Chancel arch. 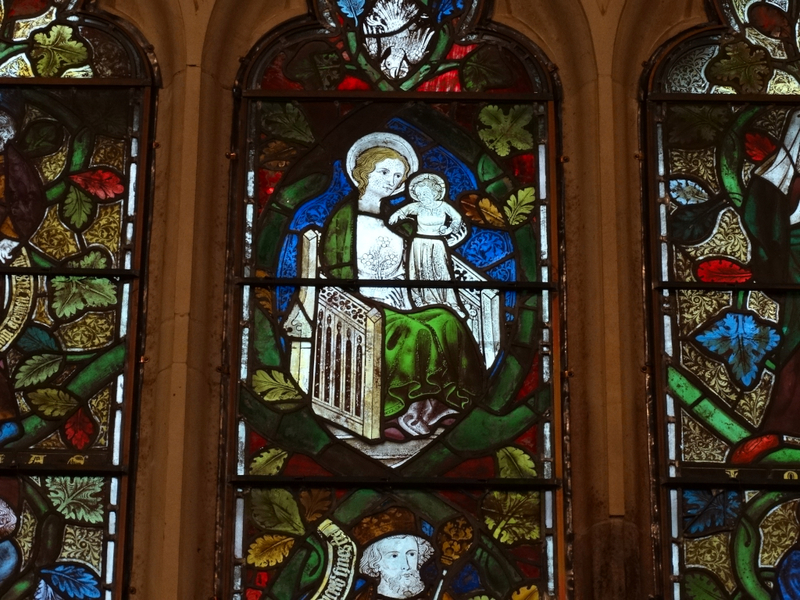 In the South Aisle we have some lovely glass. 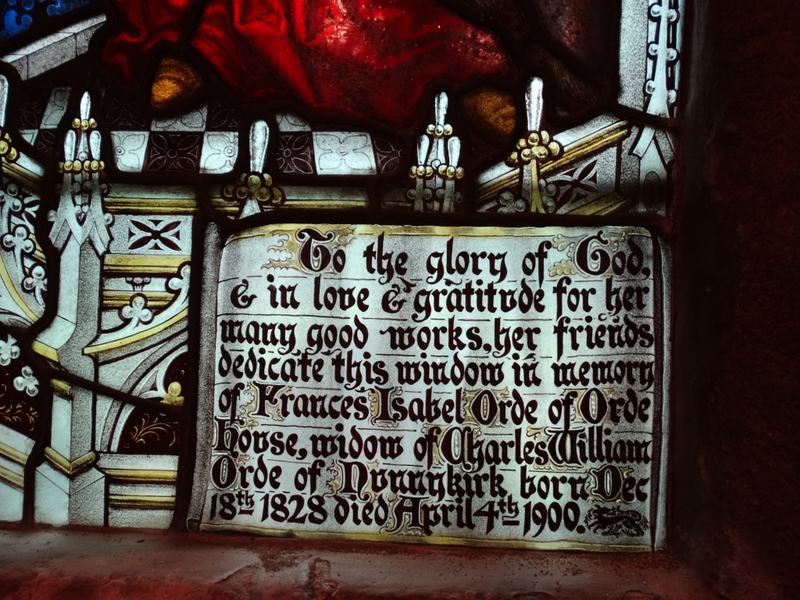 This is the Orde Window, commemorating Mrs Frances Orde of Nunnykirk. It was painted by Herbert Bryans in 1901. 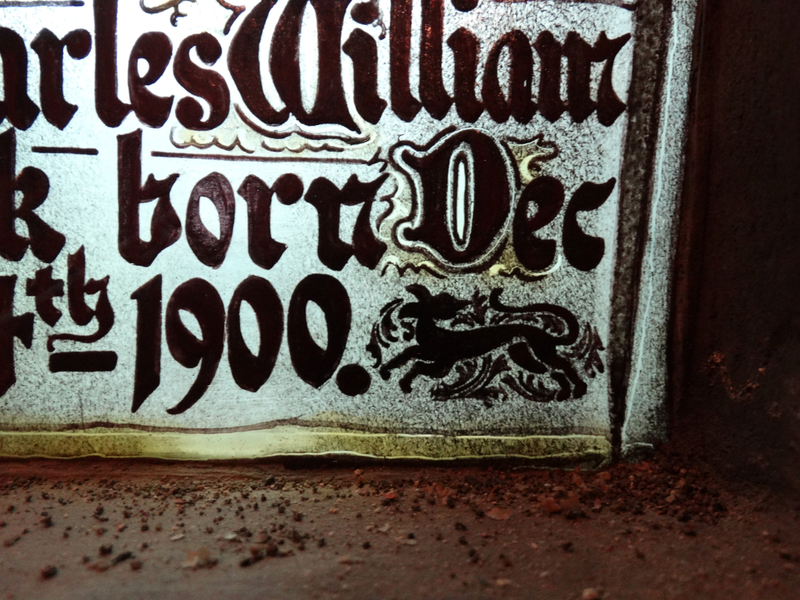 He had been trained by Kempe, lived in Mornington Crescent in London for many years – do not get sidetracked by I’m sorry I haven’t a clue – and his famous signature is the running dog. 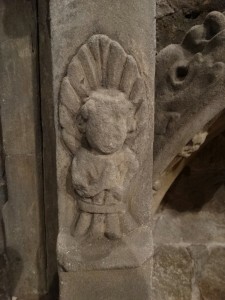 His dog is often found in the dedication panel, but can be hidden elsewhere. 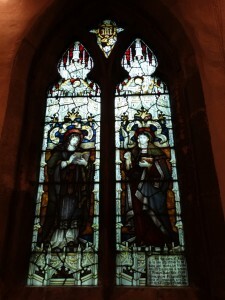 The ladies are Mary of Bethany, shown as a scholarly disciple with a book, and Tabitha (Dorcas) in Acts – with her spinning tools. 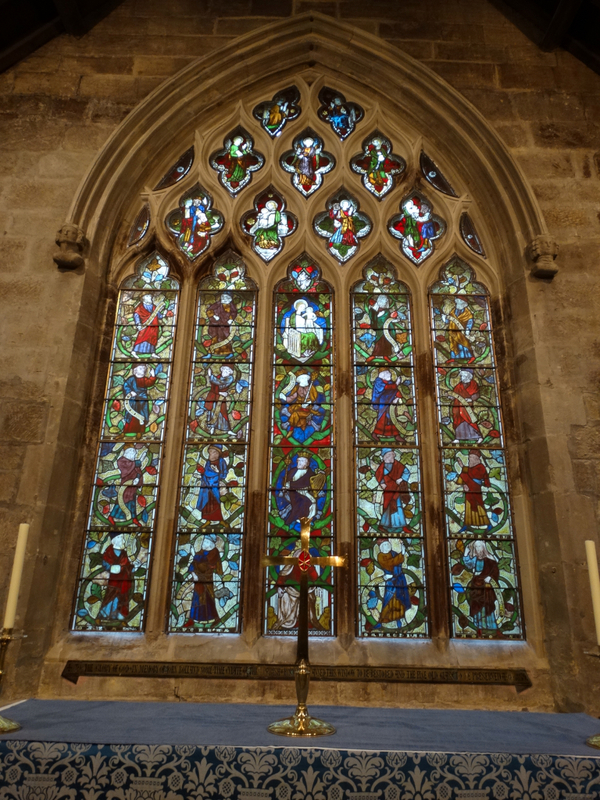 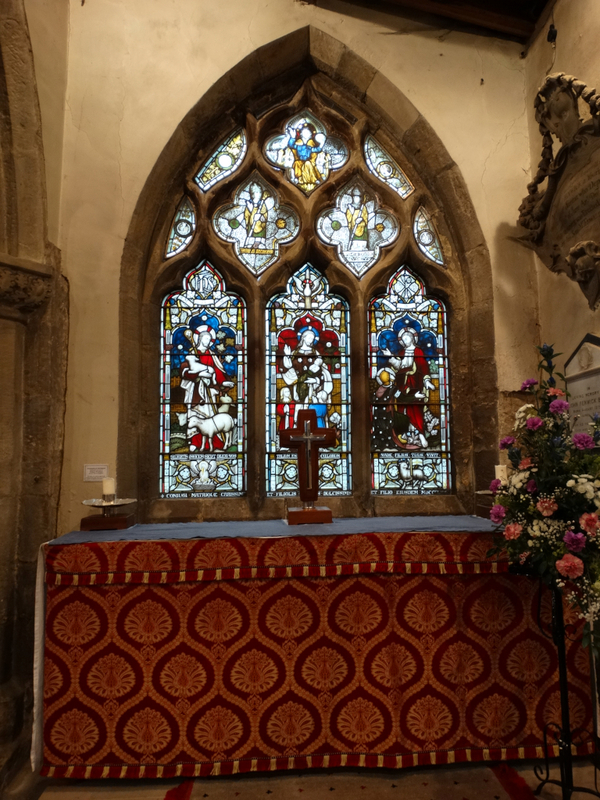 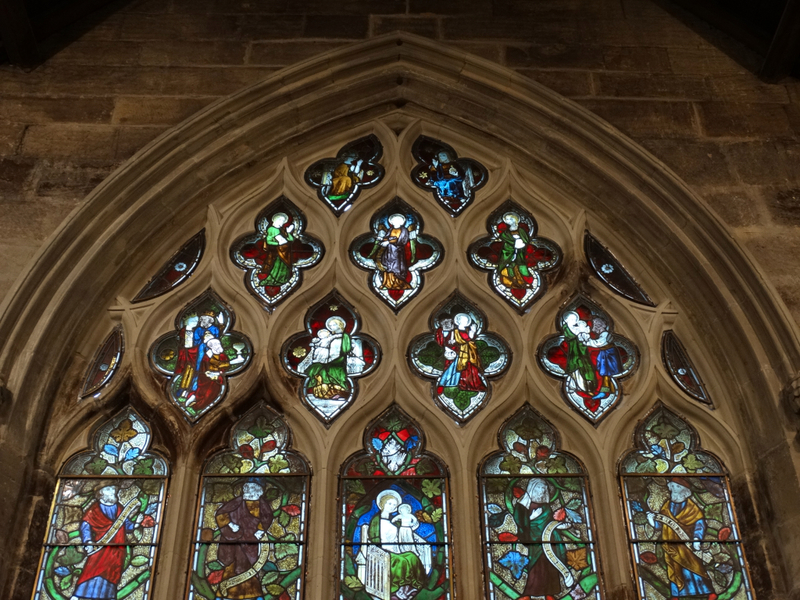 We also have the Hardy Window, dedicated to John Robert Hardy, and made by Morris & Co (1834-96). 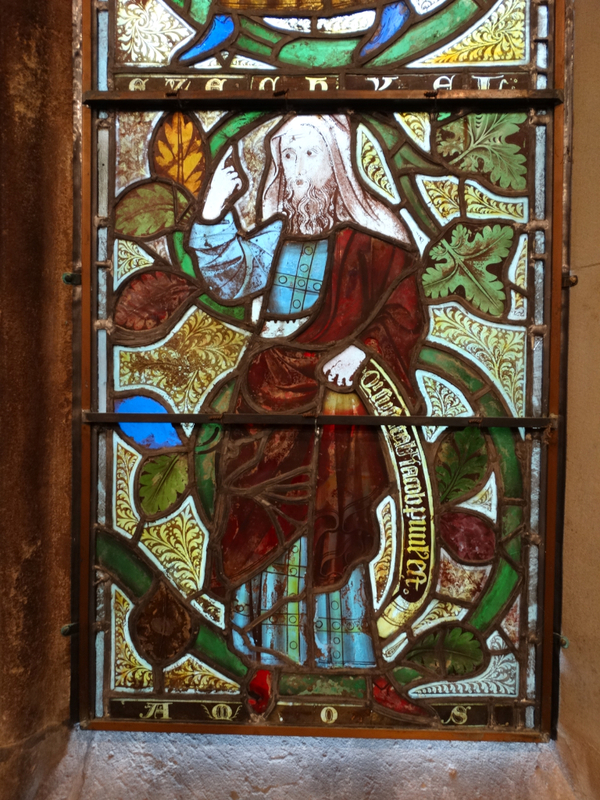 This is the firm founded by William Morris, one of the most significant cultural figures of Victorian Britain. 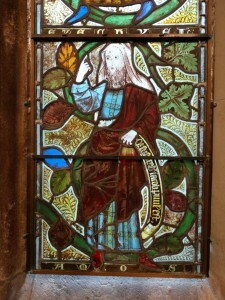 If you are near London, do pay a visit to the William Morris Gallery in Walthamstow – website. 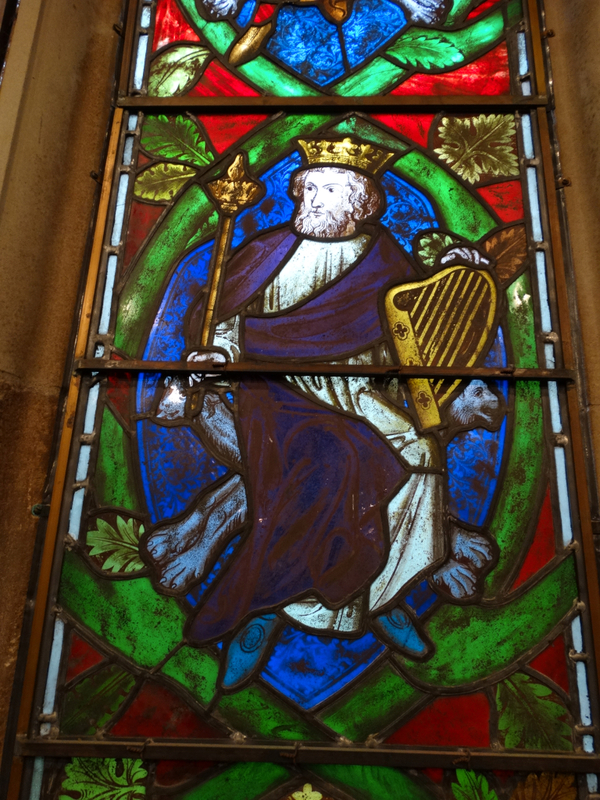 We have King David with his lyre and Jubal, a descendent of Cain (Genesis 4.21), who played the harp, lyre and panpipes and is the Father of all who play musical instruments. 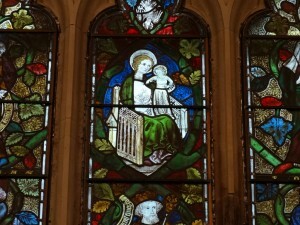 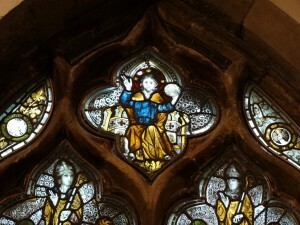 The Woodman Window in the south east corner had the oldest glass in the church at the top – early C14 glass. 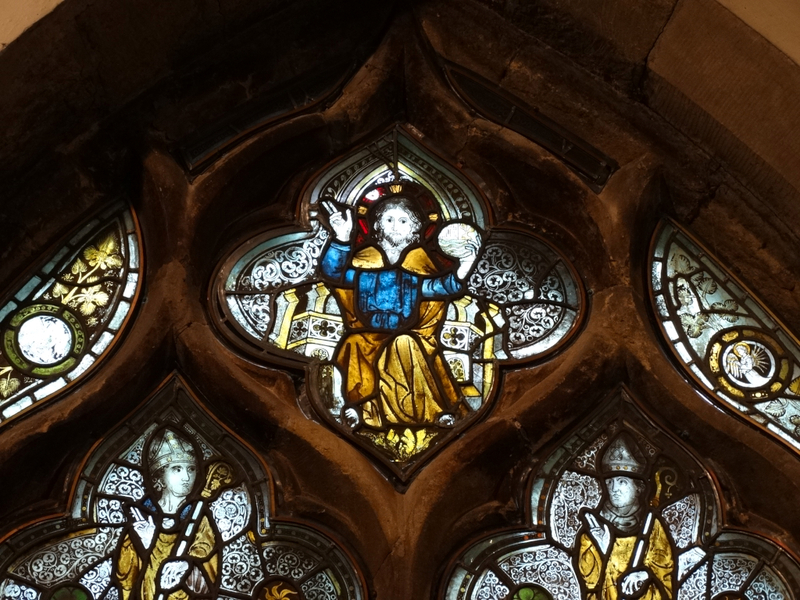 God is bearing an orb of three continents, all that was known of the world in those days. 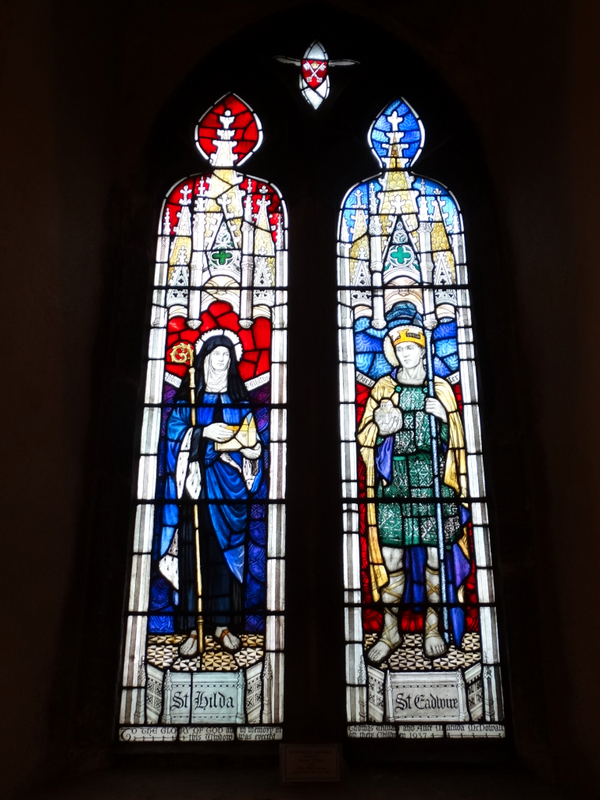 We also have St Denys, patron saint of cattle, and St Blaize, patron saint of sheep – hands up if you knew Blaise was the patron saint of sheep. 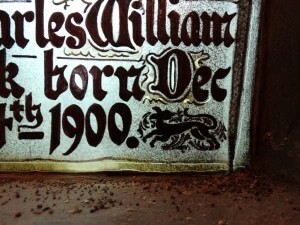 The rest of the glass dates to 1870, and is by Clayton and Bell. 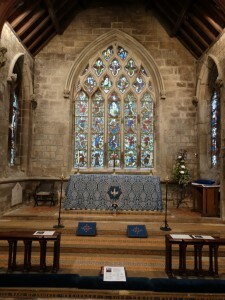 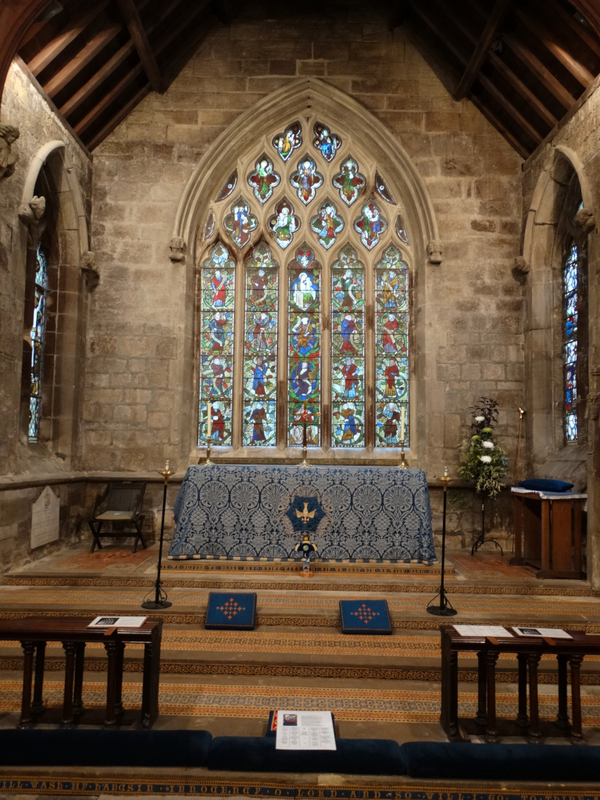 The chancel seems to have been rebuilt about 1300, the screen is modern (1889 – I like the idea that the guide describes 1889 as “modern”). 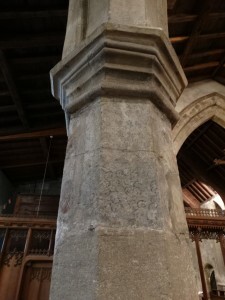 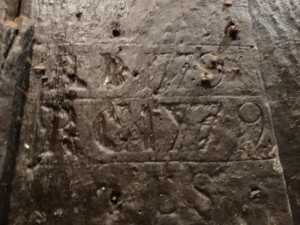 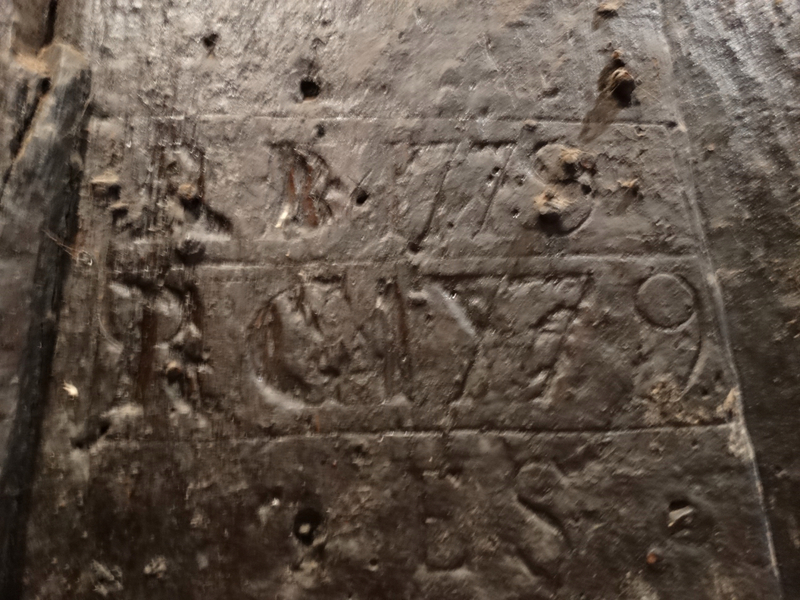 The sedilia may be C14, and shows some evidence of Cromwellian vandalism. 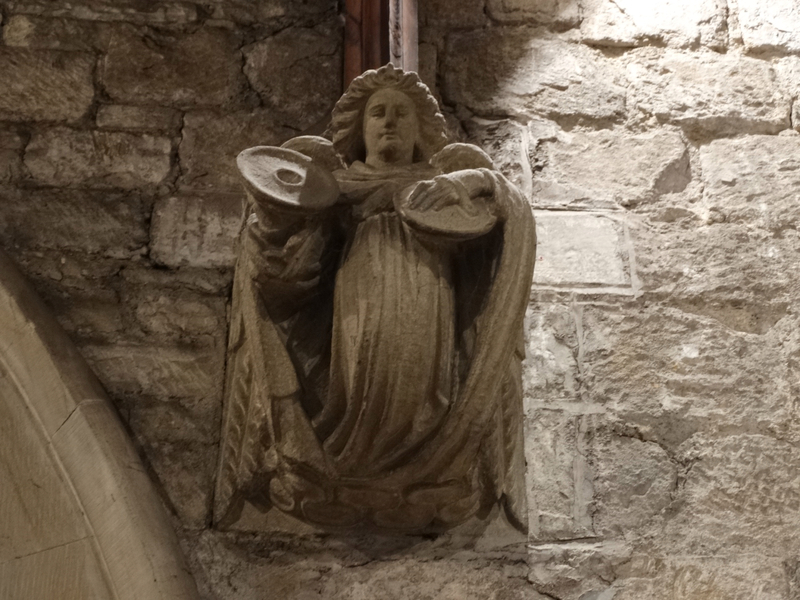 There are some lovely statues, angels, piscina and aumbry. 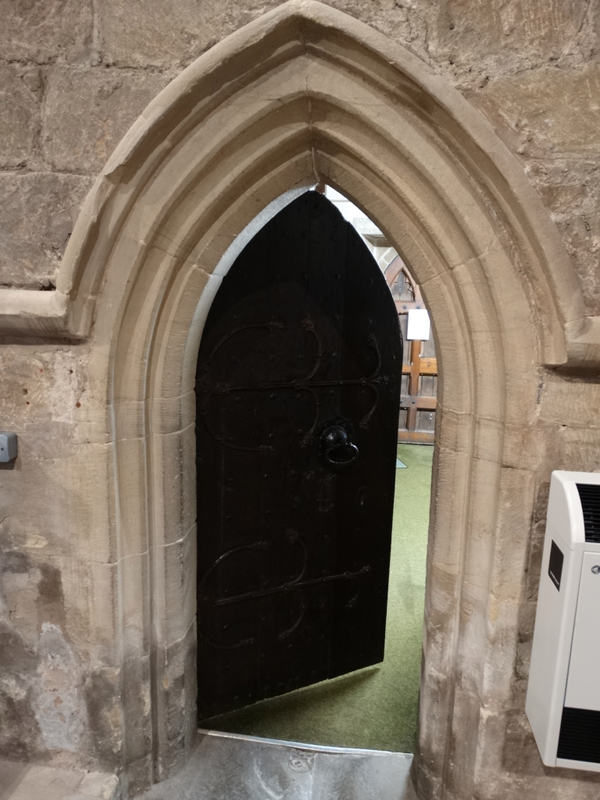 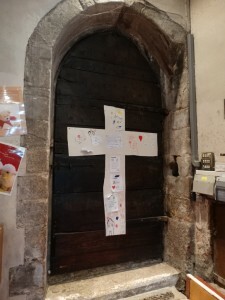 The door to the vestry is also very early, with original ironwork. 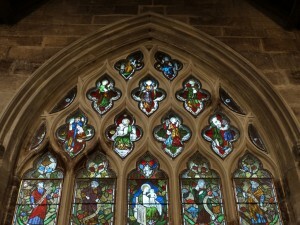 The Jesse Window, the East Window, is glorious. 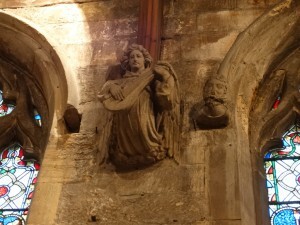 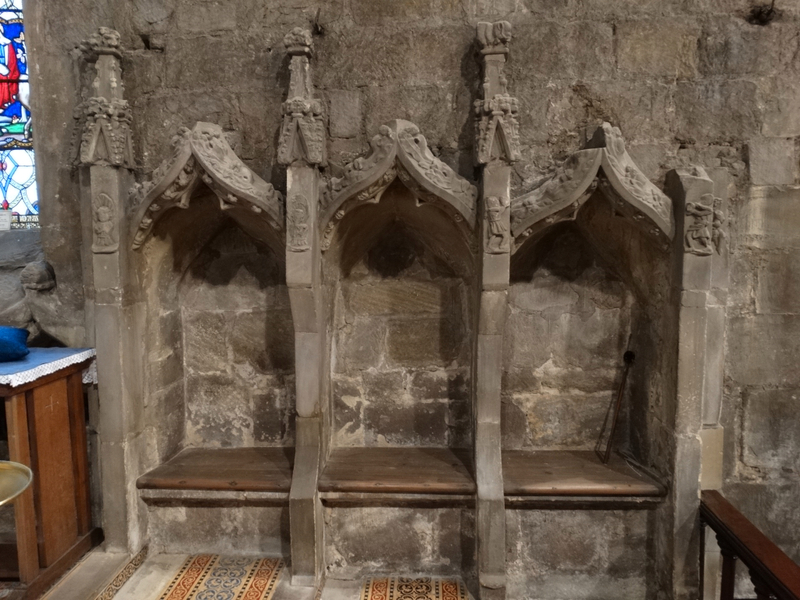 The stones supporting the hood moulding may represent Edward III and Queen Philippa, so the dating would be before 1377. 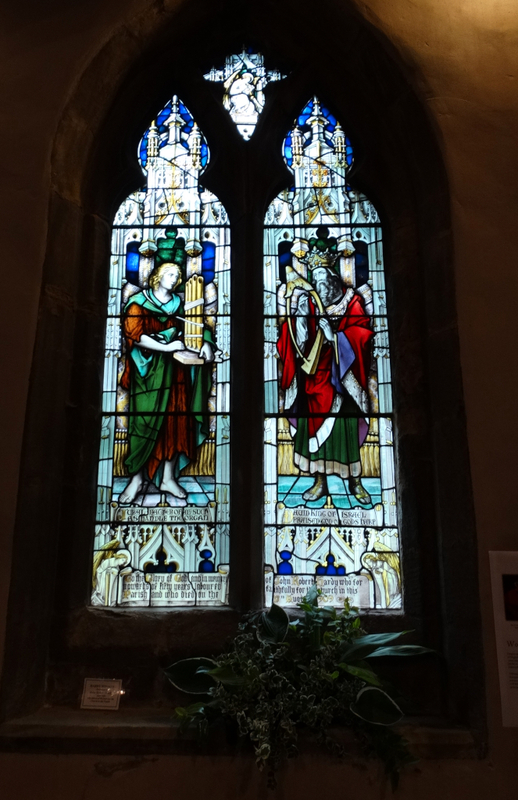 It shows Jesus as the crown and fulfilment of Old Testament prophecy – the figures are lovely. 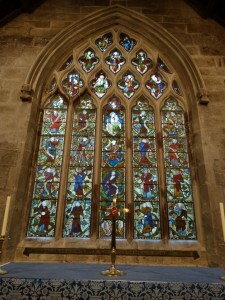 This window is the McDowall window in the north aisle. 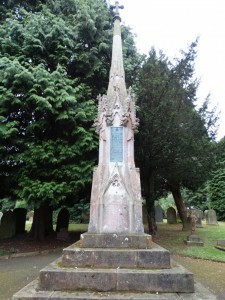 It was given in 1937. 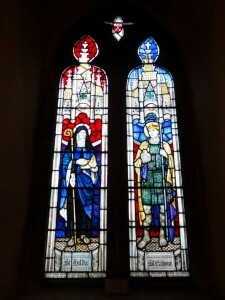 The left light shows St Hilda of Whitby, and the right St Eadwine of York. They have a nice kitchen in the aisle too. 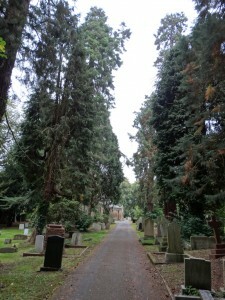 I had had a lovely explore – thanks Brian. 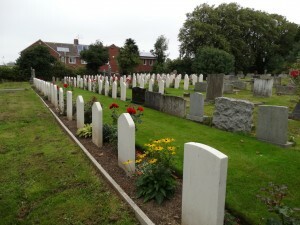 I went for a wander outside – it is a huge graveyard. 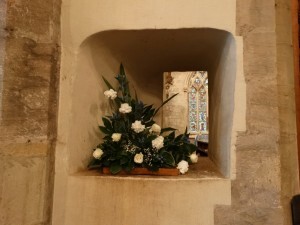 Thank God I do not have to look after it! 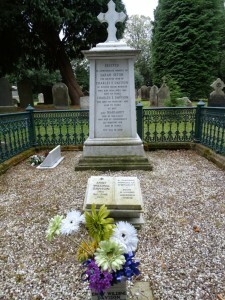 The most prominent memorial is the Bollard Memorial, which commemorates the Reverend J. Bolland, a curate of the parish, who died in the Holy Land and is buried on Mount Sion. 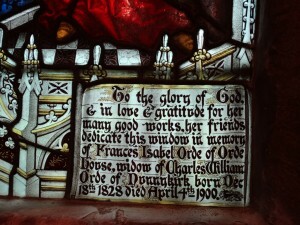 His widow also restored the Jesse Window as a further memorial. 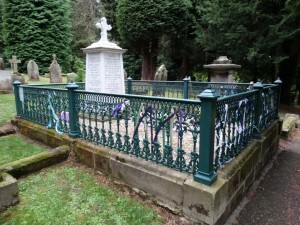 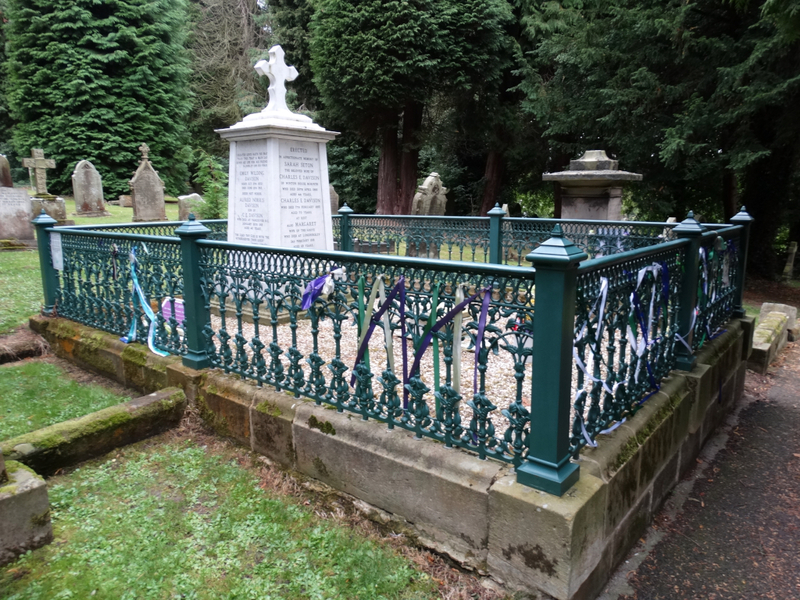 Nearby is the grave of Emily Wilding Davison, the suffragette, who died under the King’s horse on Derby Day 1913. 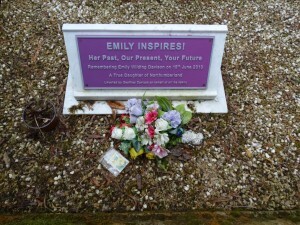 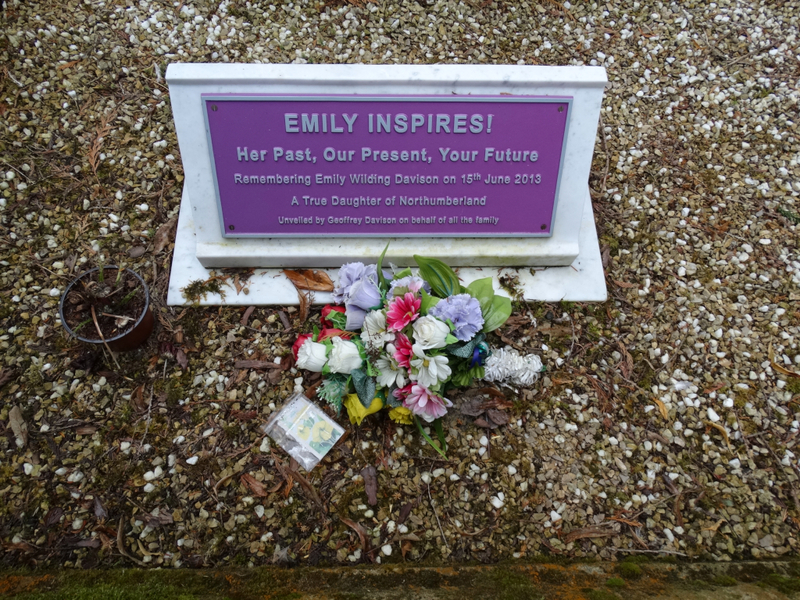 There is a lot about her here – though I think this purple memorial tablet is hideous – and here. 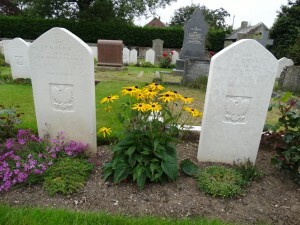 I found the Polish area of the cemetery very moving. 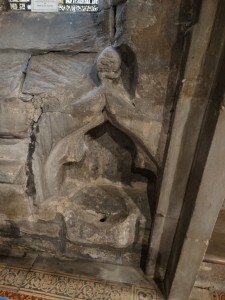 More information at this website. 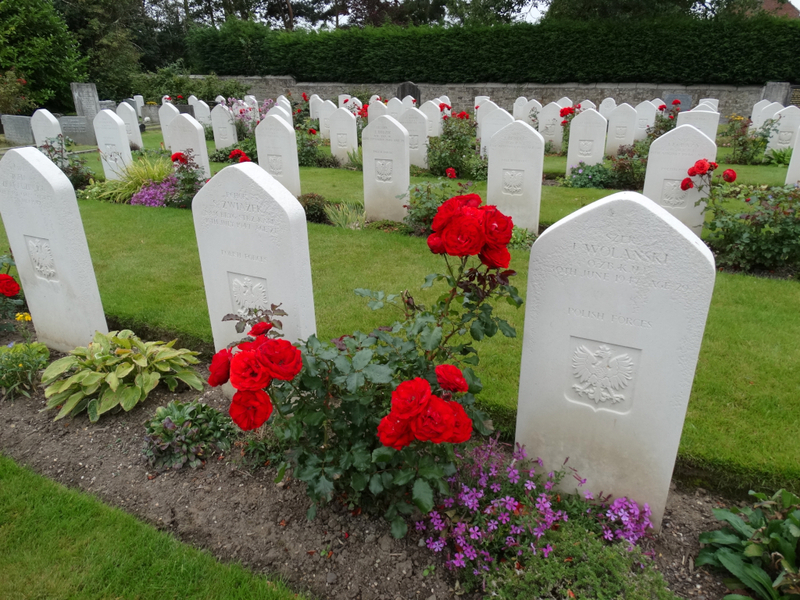 Some of the men died in WW1, others in WW2, but the camp continued after the War as a home for those Polish soldiers who could not return to their homes which were now in the Soviet Union. The website tells the story of the Camp, and has some lovely photos. I walked back to the car thinking of men and their families who gave up so much. 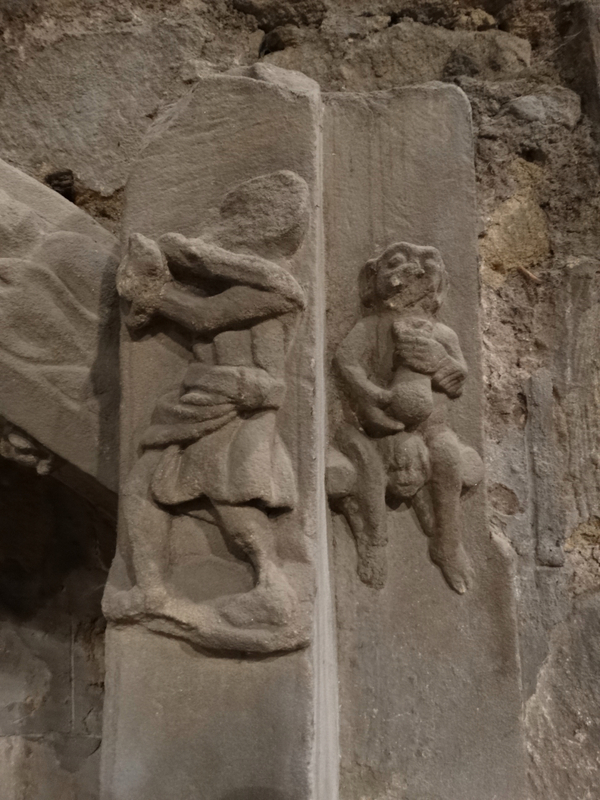 I have “met” your blogsite through reading your wife’s blog some time ago, and I subscribed to both. 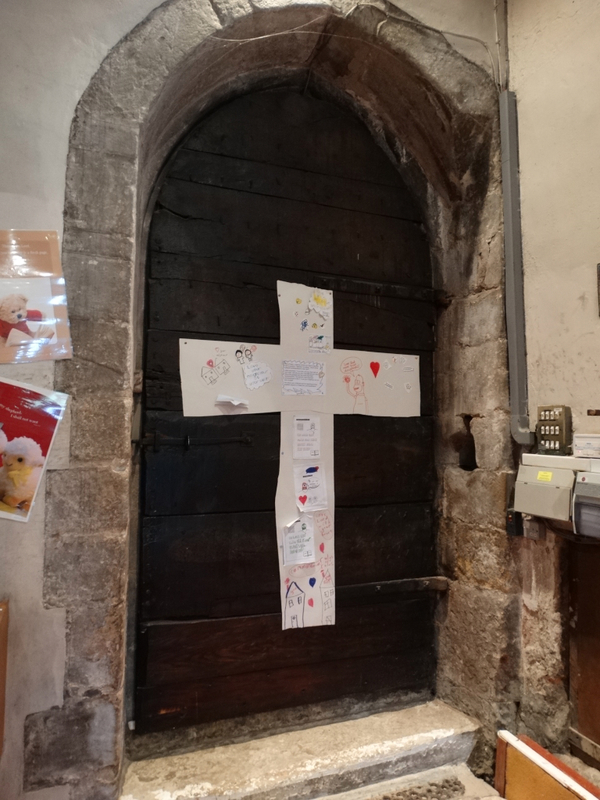 I am French and a RC myself – as all my family – but very interested in all matters of the CofE and therefore in churches. 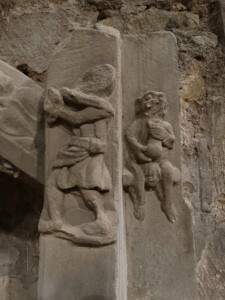 There are things familiar and others much less! 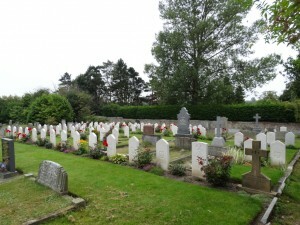 But, apart from the church and graveyard, I am very moved by the Polish cemetery that looks like so much the big military cemeteries in the East of France – my father’s family homeland. (I live in the South-West).